You are here: Home / Our Animals / Chickens / Bee Healthy Backyard Chicken Treat! I’m so excited about this week’s treat for backyard chickens because it contains one of my favorite superfoods: BEE POLLEN! Peppermint, Rose, and Parsley, Oh My! 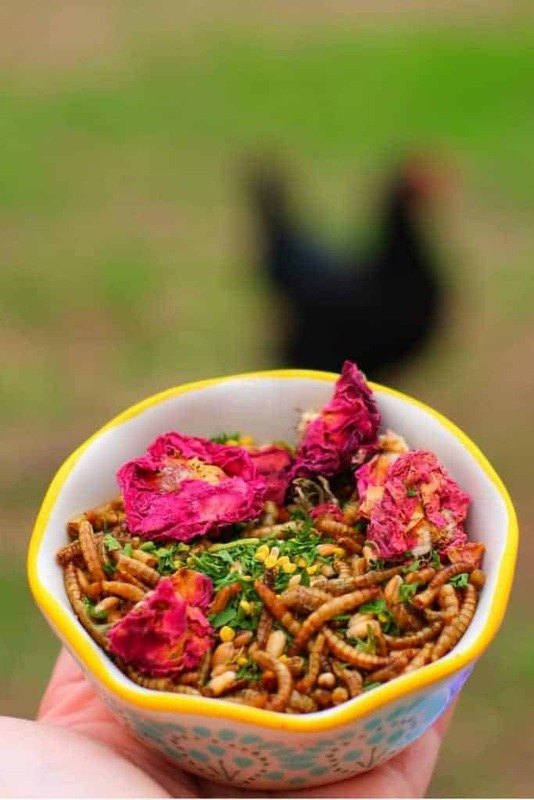 Yep, you can feed bee pollen to chickens, and as I discuss below, it’s very healthy for your hens. One of my favorite ways to share this treat with my hens is by offering it in the spring, when my flock starts to consistently lay again. The ground is muddy (yuck), which means the amount of parasites and bad bacteria that flourish in wet environments SKYROCKETS. It’s gross, and even grosser when you look at it under a microscope. Who wants a mouthful of eggs teeming with salmonella and who knows what? Not me! 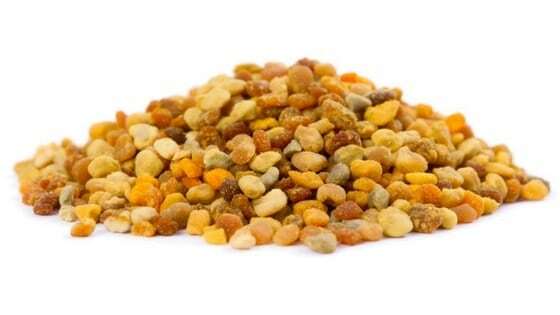 That’s why I included bee pollen in this week’s treat for backyard chickens. You’ll be surprised how healthy it is! We’re just starting to recognize the health benefits of bee pollen for humans, but believe it or not, it’s been pretty well studied for chickens. In case you didn’t know, bee pollen is one of those “superfoods” that contains not just a ton of vitamins and minerals, but also more protein than meat! Multiple studies have been done to examine the health impacts of feeding bee pollen to chickens. 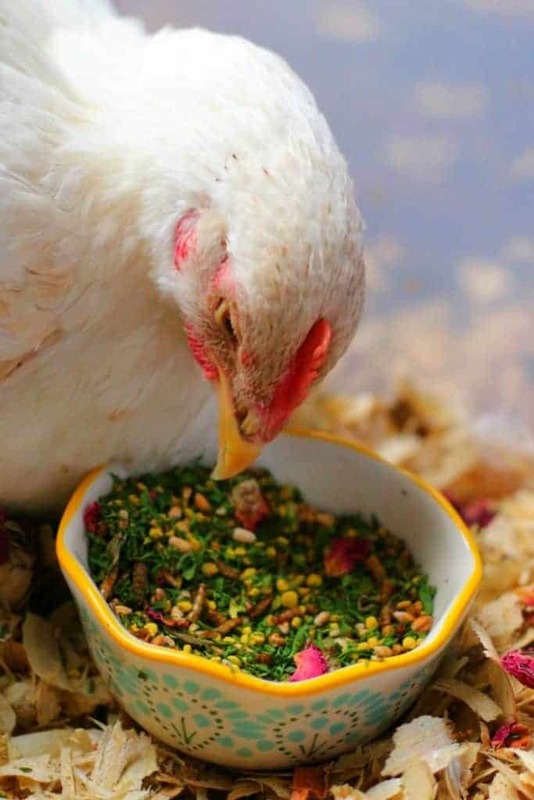 As a feed additive, bee pollen shows signs of being a powerful way to prevent parasites and bad bacteria while increasing the overall health of the chicken. In one study, chickens fed 35 grams of bee pollen per 1 kilo of feed showed more beneficial bacteria in their guts – which means a healthier bird overall. This same study also showed that bee pollen reduced the amount of bad bacteria – meaning that bee pollen showed antibacterial properties. In particular, bee pollen was shown to reduce the amount of K. oxytoca, a bacterium that can cause sepsis and colitis in people. Multiple studies have shown that chickens with higher amounts of beneficial bacteria not only GREW better (because they weren’t battling bad bacteria like campylobacter as much) but LAID healthier eggs (because the eggs were less likely to be transmitters of bad bacteria like salmonella). In another study, bee pollen was shown to increase the length of villi in the digestive tracts of chickens. In case you didn’t know, the villi in digestive tracts allow people and animals to absorb nutrients as we digest. So, longer villi have more surface area, which can mean it’s easier for your chicken to absorb nutrients – which means she’ll be healthier. It’s a small difference, but a crucial one. It helps that chickens LOVE to peck at the tiny bits of bee pollen! I’ve also included peppermint in this treat for a similar reason: Peppermint has strong antibacterial qualities while also helping to settle tummies. Rose, as well, is known for it’s soothing and skin-healing properties (that’s why you see it in so many lotions for people). My chickens particularly love rose because it’s red — for some reason, red is a popular color with hens! Parsley is one of my favorite “hidden gems” — it’s a humble herb we’ve relegated to garnish status, but it’s full of vitamins! 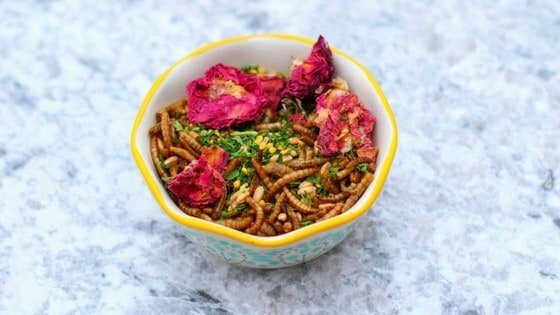 So, as your hens enjoy eating the bee pollen, they’ll also get lots of extra nutrients from the parsley. And, of course, mealworms! 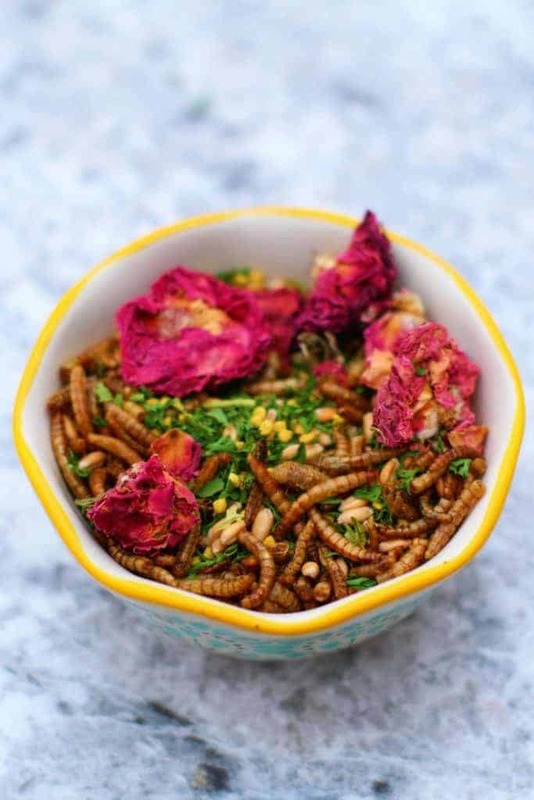 You might find that your hens go for the mealworms first, but rest assured, they’ll finish off the rest of the ingredients as well! If you’re ready to make this treat, then grab the recipe below! Combine ingredients in a bowl and offer immediately. Serve as part of a complete diet alongside grit. Can the bee pollen be added to their ‘mash’ (fermented feed)?